Beef Wellington is a preparation of filet steak coated with pâté–often pâté de foie gras–and duxelles wrapped in puff pastry and baked. Some recipes include wrapping the coated meat in a crêpe to retain the moisture and prevent a soggy pastry. There are theories that suggest that beef Wellington is named after Arthur Wellesley, 1st Duke of Wellington. Some theories go a step further and suggest this notion was due to his love of a dish of beef, truffles, mushrooms, Madeira wine and pâté cooked in pastry: there is a noted lack of evidence supporting this. 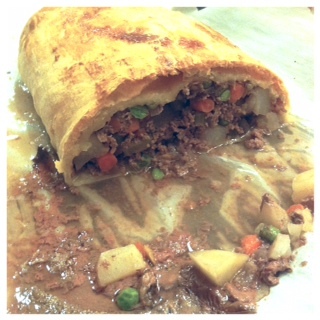 “Wellington” is sometimes informally used to describe other dishes in which meat is baked in a puff pastry. The most common variations are sausage Wellington, lamb Wellington and salmon Wellington; however, few compare to the noteworthy beef Wellington. The pricey ingredients and tedious preparation make the dish a companion in fine dining. I use a few baby carrots chopped finely, but I recommend buying a large carrot and chopping it finely. I used about ¾ a celery stalk. I wanted to keep the ratio of carrots to celery rather equal. Use a small potato and be sure to chop it in similar fashion and size as the carrots and celery. You want the potato to be able to cook through. I used one large Portobello cap mushroom. If you use button mushrooms, you are skimping on taste for my preference. I used dried thyme. I sprinkled what I thought would be equvaliant to the sprigs of thyme. Thyme is a little less potatant than rosemary, and I believe it compliments the ingredients better: you be the judge. I suggest using frozen peas because fresh peas will become too mushy while being cooked. The frozen peas allow for thawing and cooking to be done within the pastry. Graciously coat the exterior pastry with the egg. It will create the browning effect that Wellington is notorious for possessing. I used 1 package of puff pastry; however it was only 250 grams. You need the full 500 grams or you will have to lessen the amount of stuffing. The pastry needs to be rolled thin so that it can cover stuffing. Folding it burrito style is the best chance at keeping the juices from leaking out and making the bottom soggy. My pastry was not large enough for my stuffing; thus, I have problems keeping my pastry shut when I flipped it over. Leave a comment with your favorite beef recipes. Follow my Pinterest for more recipes. Check back again next Wednesday for more tips and tricks from The Cooking Bug.